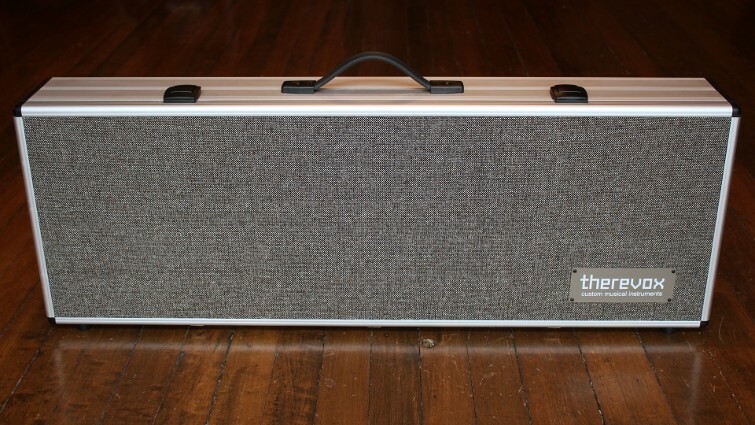 Our tweed road case is designed to perfectly fit an ET-4 with a side compartment to hold an expression pedal, power supply or other accessories. Made from an extruded anodized aluminum exterior with high quality Franzen latches and Cheney strut hinges. The main panels are covered in our own woven tweed. The inside is lined with 1" high-density foam and a piece of Black Walnut separates to the compartments and also bears a hand-stamped serial number. The nameplate is powder coated steel with a silkscreened logo. Designed and built by Therevox to protect your investment. Main compartment dimensions: 30 x 11 x 4"
Accessory compartment dimensions: 4.25 x 11 x 4"
Outside dimensions: 39 x 13.5 x 5.5"
We ship wordwide. Shipping a case with or without an instrument is approximately $120-150 in North America or $220-250 to Europe.